When the new sandwich joint Sloco opened in Nashville, I was dying to go, but I had to go with just the right person, so it took me a few months to try it out. 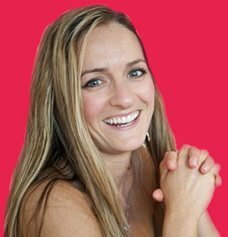 I went with one of my best friends who studied at Slow Food International, which means her values and those of Sloco align well. The chef-owner of Tayst, Jeremy Barlow, is the brainchild behind Sloco Nashville. Tayst is the only green certified restaurant in Nashville and it focuses on local, seasonal ingredients, and serves the more high-end crowd. 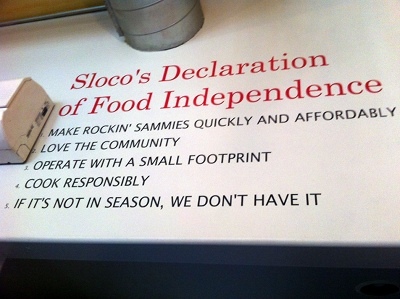 Sloco keeps the same principal of local food, but everything on the menu is less than $10. I love that Jeremy is working to integrate his ideals into every sector of the Nashville population. Most people are accustomed to eating fast food sandwiches with the cheapest possible ingredients, and Sloco gives an entirely new edge to sandwiches. Sloco uses only seasonal vegetables that are grown nearby, so the ingredients change with the seasons. You are not going to see a thick slice of tomato on a sandwich in the winter or root vegetables in the summer. 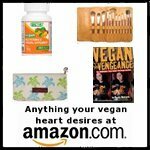 Their veggie options will constantly change, even from week to week, based on what's available. 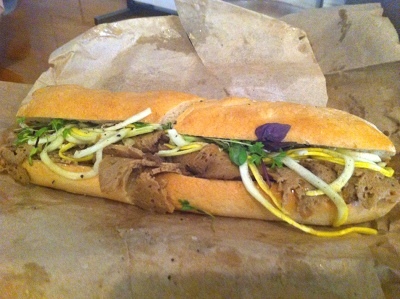 I had the Shaved Seitan sandwich and thought it was delicious. Their seitan was peppery and perfectly cooked (at home I end up with a lot of rubbery, chewy seitan), and then sliced thinly. They covered it with some microgreens and shaved squash pieces. 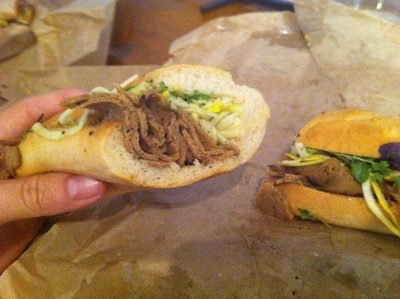 They use a sesame seed dressing that brought the whole sandwich together perfectly. 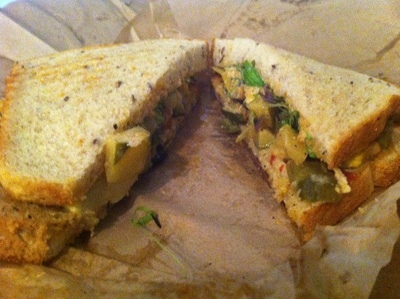 It is a very nice vegan sandwich, and so pretty! One of Sloco's mission statements is to serve responsible portion sizes. I fully believe in that concept, as most people eat more than double the amount of food they are supposed to eat. The only thing I had to say that was slightly negative about Sloco was the fact that their Slow Roasted Veggie sandwich was on the small side. It had no more than a few tablespoons of grilled vegetables total, and even paired with good homemade bread still makes for a pretty small lunch. Don't get me wrong- the vegetables (August vegetables were onions, zucchini, and summer squash) were flavored perfectly; it's just that the sandwich could have used quite a few more to qualify as a satisfying lunch. While their meat sandwiches may only have a few ounces of protein to be a proper portion, you have to add more veggies to get the same fullness level as the rest of the sandwiches. This is a common problem for vegans-- the size that might work for a piece of meat is going to make a very small portion of veggies, even if you are comparing calories alone. Vegans like to eat and be full too! The other vegan sandwich that we didn't try was the Vegan Meatball Sub. They make their "meat"balls out of quinoa and beans, and cover it with homemade tomato sauce. It's layered on a sub roll and everything is capped off with a bit of Daiya cheese, known to all vegans as the best melting cheese available right now. The bottom of the menu says that all sandwiches can be made vegetarian. I would imagine they either leave the meat off the other sandwiches or sub in some seitan in place of it (ask to verify this), which could be quite good, although of course you'd have to negotiate the cheese to be switched and any suspect dressings like aioli or slaw to be removed. With three great vegan choices with ingredients that are constantly shifting with the seasons, I doubt I'd opt to go to the trouble of substituting any sandwiches in the future. They had some really nice, cute touches to the building. Their sprouted micro-veggies were on full display right on the bar, which is a fun way to introduce new food to people. We enjoyed that they used recycled glass Mason jars to serve vegetable-infused water. 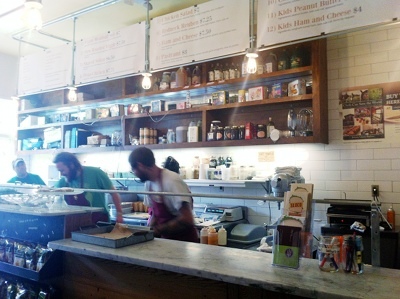 I also always love restaurants that are willing to show you almost all of the action right behind the counter. They display their ingredients on open shelves, and you can see everything is top of the line. And, they have a few nice side options like avocado oil potato chips, pickles, and pure cane sugar sodas. Sloco Nashville also maintains their mission to change the world with food, as Jeremy discusses in his book, Chefs Can Save the World. I totally agree that if enough chefs introduce enough amazing fresh, local food to enough customers, more people will start expecting that level of food all the time. Perhaps more will buy from farmers markets and build their own vegetable gardens. Food like this does make a difference, and it tastes really good too. If you're visiting from out of town, you should definitely visit the 12th South area of Nashville. Over the past few years, restaurants and bars have been sneaking their way in to the Belmont scene and adding a ton of energy to the area. After lunch at Sloco, stop at one of the iconic Nashville establishments, Las Paletas, and have a homemade, fruit-based popsicle. Most of the fruit flavors are vegan. I'll definitely be back to Sloco Nashville, and you should try it too!